Why did you choose William & Mary Law? William & Mary seemed like the best fit for me personally. Although William & Mary's national reputation and cost of attendance were big selling points for me, I was particularly attracted to the law school's welcoming and inclusive community culture. When I visited Williamsburg during the Admitted Students Weekend, the collegiality and warmth of the student body really stood out; I felt as though I was part of a family. William & Mary Law was an easy choice thereafter. Tell us about your legal career so far. I am a first-year associate in the Commercial Law Counseling Group at Morris, Nichols, Arsht & Tunnell LLP in Wilmington, DE. My practice involves handling complex transactions, such as mergers and acquisitions, and providing legal opinions on various commercial law matters. What were some of the most rewarding experiences during your time at W&M? I found that opportunities that allowed me to give back to the community were the most rewarding. Helping veterans achieve their goals in obtaining much-needed benefits from the VA was a deeply satisfying experience. The law schools many clinics, such as the Lewis B. Puller, Jr. Veterans Benefits Clinic, allow students to have an immediate impact in the community. I also helped organize fundraisers for the school's Bone Marrow Drive, whose mission is to offset the cost of DNA testing for potential bone marrow donor matches and increase awareness of the need for such donors. Being able to help put together 5K run/walks, pie eating contests, and various other fun activities for a good cause was definitely a highlight of my time in Williamsburg. In addition to its strong national reputation and relatively low tuition, I chose William & Mary because it attracts students who want to study law in a collegial environment. We all are familiar with stories about cutthroat law students ripping pages from books and sabotaging their classmates. I did not want that. I knew law school was going to be difficult enough without such gamesmanship, and I wanted to spend three years in an environment where students succeeded on their merits, not at the expense of classmates. William & Mary fit the bill. After graduating from William & Mary in 2011, I moved to Montgomery, Alabama, and spent one year clerking for Judge Ed Carnes of the U.S. Court of Appeals for the Eleventh Circuit. I then accepted a position as a litigation associate in the Washington, D.C., office of Arnold & Porter LLP, where my work focused on complex commercial litigation at the trial and appellate levels. After three years at Arnold & Porter, I decided to focus my practice on appellate litigation and joined my current firm, Gibson, Dunn & Crutcher LLP. As a member of Gibson Dunn’s Appellate and Constitutional Law practice group, I represent major corporations, trade associations, and other business entities in the U.S. Supreme Court, federal courts of appeals, and state appellate courts. My practice spans a variety of subject areas, including constitutional law, class actions, antitrust, banking, product liability, administrative procedure, and preemption. I also have worked on several trial teams, where my practice includes preparing major motions and helping to identify, and preserve, issues for appeal. What do you like best about practicing law? Problem solving in a team environment. Clients hire Gibson Dunn to solve their most novel and complex legal problems. Helping clients accomplish their goals despite such uncertain legal terrain requires creativity, hard work, and grit. I enjoy that challenge, especially when working with colleagues who approach the problem with unique views, experiences, and insights. The most rewarding and enjoyable part of my job is collaborating with colleagues to develop an innovative solution that solves a difficult problem facing a client. How did W&M Law prepare you for practice? During orientation as a 1L, I remember someone on the honor council giving a presentation and reciting a C.S. Lewis quote: “Integrity is doing the right thing, even when no one is watching.” That quote stuck with me, and it embodies the culture of William & Mary. Students are trusted and expected to act with integrity in everything they do, despite the stresses and demands of law school. The same is true for lawyers dealing with the stresses and demands of legal practice. It might be tempting to cut corners or lower standards when faced with a difficult client, judge, or opposing counsel, especially when no one is watching. 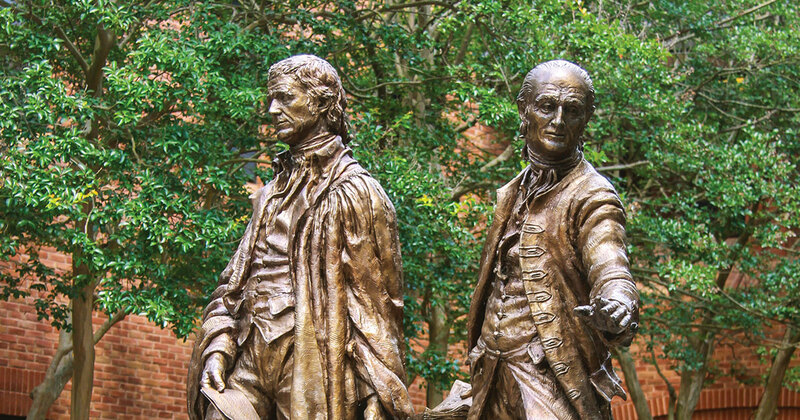 But William & Mary ingrains in students that no case, no client, and no legal victory is more important than maintaining professional integrity – a lesson I learned in law school that guides my decision making to this day. When I first came to William & Mary I was surprised and impressed by the law school’s tight-knit community. It is an environment where students support one another by encouraging each other to take risks and strive to be better. From the first day on campus, faculty, staff, and the upperclassmen will actively support and help you acclimate yourself to law school. In choosing a law school, I think it is important to find an environment where you will be challenged and supported to meet those challenges – William & Mary was that place for me. I am an attorney at Withers Bergman LLP, an international private client firm, in its Connecticut offices. My practice focuses on estate planning and probate, both domestically and internationally, for high net worth individuals. This gives me the opportunity to use a variety of skills sets and keeps things interesting as one day I am buried in the tax code while the next I may be in court. One of the key parts of a W&M education is getting the chance to learn directly from attorneys who practice. The practice of law is not an academic or theoretical exercise. People come to me with problems that need an effective solution. This involves having not only strong writing and research skills, but also practical sense. Having the chance to interact and learn from practicing attorneys is key to a strong legal education that leads to the work-ready graduates William & Mary produces. How do you feel you live the ideal of the citizen lawyer? Being an attorney is more than a job – it is a special profession. Yes, it is a lot of work to become a lawyer, but it is still a privilege. With that privilege comes the responsibility of doing more than going to work, billing hours, and collecting a check. Being a citizen lawyer means you give back because it makes your community better, your profession better, and you better. In my practice I try to achieve the citizen lawyer ideal in three ways. First, by getting involved in pro bono efforts you can help those who would otherwise not be able to represent themselves. Second, mentoring attorneys as they come into the profession is a way to give back, as I have been a beneficiary of others helping me along the way. Third, by writing, publishing, and participating actively in bar associations, I am trying to give back to the legal community. Is there anything else you would like to say about your time at William & Mary Law? One significant advantage of William & Mary for long term success in the profession is learning how to find a balance. Both in law school and in practice, you have to put in a lot of hours. Students take themselves seriously and place high expectations on themselves. However, at the end of the day, at William & Mary Law people knew how to relax and there was a great social atmosphere. I learned how to balance work and life as well as integrate the two. This makes for a sustainable career. I wanted to go to a well-respected, affordable, and nurturing law school in my home state. No other place can fit those parameters better than William & Mary. Tell us about your career so far. After graduation, I clerked for Judge John A. Gibney, Jr., of the United States District Court for the Eastern District of Virginia in Richmond. After my year on the district court, I moved to Charleston, West Virginia, to clerk for Judge Robert B. King of the United States Court of Appeals for the Fourth Circuit. Following my clerkships, I accepted a position as an associate in the Richmond office of Hunton & Williams LLP, where I focus on litigation and appellate matters. During my time as a law clerk, I always had to be prepared to answer questions from a variety of people: the judge, another law clerk, courthouse staff, and even pro se litigants. I had to think quickly and give correct answers, which required me to comprehensively understand a case's facts and the rules that guided it. Now in private practice, I have to be prepared to do the same thing with partners, other associates, and clients. It's a bit like being on call every day, and I got plenty of experience with that during my time at W&M. I loved being on the Moot Court Team. Preparing for a tournament was usually stressful but undeniably rewarding. At the start, while researching the issues and drafting a brief, I might think narrowly about my position. Over time, and as I did practice arguments with my teammates, I would start to make broader connections to other areas of the law. Finally, in the heat of a competition, the most important issues came into focus through judges' questions, and I loved that I had to think quickly on my feet to draw on the material I'd learned over many months. I also enjoyed taking lessons I learned through that process and applying them to the next competition. Since law school, I've also come to appreciate the importance of my time as a member of the William & Mary Law Review. The tedious hours spent cite-checking and editing have paid dividends in the early stages of my career, when I've found myself drafting important memos and opinions that no one else will proofread before I submit to a judge or partner. Being on the Law Review also built a fluency for me in legal reading and writing that I'm still expanding today. What do you remember most fondly about your law school experience at W&M? My fondest memories of from W&M involve the people that became and remain my closest friends – including my wife, who I met during 1L. Far from the stereotypical, ultracompetitive law school, William & Mary fostered a supportive and friendly environment where I got to know and work closely with people from diverse backgrounds and life experiences. I especially remember the first semester in Williamsburg, when we helped each other get through those first difficult classes, went to bar reviews together, and explored Williamsburg. From top to bottom, I truly enjoyed my experience at William & Mary Law School and would not change anything about the experience if I had to do it over again. From the people – including classmates, administrators, and faculty – to the place itself, William & Mary created an environment where I felt both motivated and comfortable. I was in the process of choosing my next steps following my time in military service. A good friend of mine from undergrad and the Army was attending Marshall-Wythe. He knew I was looking at potential graduate programs and law schools and suggested I take a look at what Williamsburg and William & Mary had to offer. From there everything just fell into place. Early on I knew I had interests in policy and business rather than the traditional practice of law. So I became a consultant with Deloitte Consulting’s federal practice in Arlington, Virginia. After two years there, I left Deloitte and became the Constituency Outreach and Veterans/Military Families Outreach Director for President Obama’s reelection campaign in Virginia. A few months after the campaign I joined the Administration as the Deputy White House Liaison (and shortly thereafter the Acting White House Liaison) at the Department of Defense. I served in that capacity for thirteen months and then was asked by the White House to move to Veterans Affairs. Once my efforts at VA were complete, I moved to Homeland Security were I served as an Advisor to the Science and Technology Directorate (S&T). I am now the Executive Director of the Truman National Security Project. Thus far I have spent nearly all of my career as a public servant, both before and after law school. The basic principles that encompass the citizen lawyer are a part of what ultimately drew me to Marshall-Wythe. Without community we as individuals would lack a certain level of social support that is an integral part of achieving success as a well-balanced person in modern society. We should all have a want and desire to see our society thrive so that more individuals may be successful and thus increase the standard of living for all those within the community. It may be idealistic, but I believe these are the types of pursuits that help us better ourselves as private citizens and a nation as a whole. The citizen lawyer is ultimately a pillar of societal wellness. I made remarkable friends during my time in law school. I met a great deal of brilliant and kind people that continue to shape and enhance my life these years later, and if I’m lucky the same will be true in the years to come. It’s my belief that no one has ever been one hundred percent successful on their own in anything. We all need help from time to time. Law school is no different, and furthermore, serves a great example of that axiom. Williamsburg is a wonderful community and a beautiful place to study law. More importantly, Marshall-Wythe is one of the most welcoming and supportive atmospheres in which I have worked and lived. Professors and administrators alike want people to succeed and will do all they reasonably can to see that we maintain our competitive edge without sacrificing our compassion or principles. At its very heart, that is a part of what the citizen lawyer represents to me. I wanted to attend a law school that not only had a strong focus on public interest and government work but that also had easy access to the Washington, D.C., market. However, I wanted to escape the city for my law school years to an area where I could focus on studying. William & Mary, with its picturesque location and well-respected reputation in the legal community, fit the bill perfectly. My career path has been one of exploration and luck. I quickly learned in law school that the minutia of litigation was not for me, but I enjoyed broader policy arguments and legislative drafting. With that realization, I switched gears and focused on finding a policy-oriented job in D.C. I was lucky enough to work as a fellow with a fantastic education policy firm shortly after taking the bar before then accepting a job as a lobbyist for the American Association for Justice and two years later a lobbyist for the environmental law firm Earthjustice. I was then presented with the unbelievable opportunity of becoming a Legislative Director for a progressive member of Congress as my first Capitol Hill job. I was with Rep. Johnson (D-GA) for about a year and half before I had the good fortune of being poached by the House Judiciary Committee – which in my opinion is the dream committee for lawyers. On the committee, my portfolio focuses on government oversight, foreign & domestic surveillance, national security, cybersecurity, election security, white collar crime, counterterrorism, and emoluments. I also work on lengthy congressional investigations on a variety of issues falling within the jurisdiction of the Department of Justice. Working on Capitol Hill is both an exciting sprint and a chaotic marathon. As someone who considers herself to be a jack-of-all-trades – who knows everything but is an expert at nothing – I thrive in the fast-paced and intense environment the Hill presents. Working for Congress and with policy organizations felt like the perfect place where my talents and personality would be well utilized. Now that I am on a Committee, I have the opportunity to hone my skills and expertise in a more narrow set of issue areas that interests me as well as working closely with Democratic Leadership. What I like most about legislative work is how abstract it is while still having far-reaching effects on the public. For example, moving a comma or changing one word can have significant consequences to the meaning of a bill or law. What I liked most about being a lobbyist is that I was constantly on my toes (you never know what Congress will decide to do). It kept me sharp and challenged my versatility and skills as a lawyer. I have had the great fortune to attend a respected institution in William & Mary and to work for well-known organizations here in D.C. Thanks to these experiences, I have and continue to make invaluable connections and have been exposed to a variety of exciting and cutting-edge legal practices. More important, these experiences have helped me figure out what I want to do with my life. Being excited to go to work every day is a luxury for which I am very grateful. I love problem solving and being able to help businesses and individuals with a specialized skill set. The practice of law has been very challenging, but it is incredibly gratifying to draft dispositive motions or their oppositions for a client and win, knowing that I added real value to the client's organization. Upon graduation, I moved to New Orleans and began my career at a mid-sized New Orleans firm, Stone Pigman Walther Wittmann LLC. At Stone Pigman, I had a general civil litigation practice and practiced in the areas of business litigation, family law, employment discrimination, and insurance coverage and defense. Presently, I am a commercial litigation associate at a larger regional firm, Phelps Dunbar LLP, in their New Orleans office. My practice now primarily involves business litigation. I had some great professors at William & Mary. I really enjoyed the seminar classes where you could dig in deep to a topic and work on an in-depth paper on the topic of your choice. I also enjoyed the Summer in Spain program. Now that I am in private practice, I don't know when I'll have another opportunity to travel abroad for a month or more, so that opportunity to study in Spain and visit a few other countries is one that I deeply appreciate. I made great friends! In particular, the friends that I made through the Black Law Students Association (BLSA) are still my friends today. Whether we were having intense discussions about how to plan the annual Oliver Hill banquet or sharing study tips, BLSA was a great resource both locally and nationally. Since law school I have specialized in international law and gained broad experience across both the public and private sector. I started my career with Shearman & Sterling LLP in Washington, DC, focusing on litigation and Foreign Corrupt Practices Act investigations. While at Shearman & Sterling I also worked pro bono for the United Nations International Criminal Tribunal for Rwanda in Arusha, Tanzania. I participated in Shearman's associate deferral program with International Bridges to Justice, a non-governmental organization based in Geneva, Switzerland, dealing with human rights and rule of law initiatives. During this time I managed a global fellowship program and successfully expanded the outreach of the organization to Latin America. Upon relocating to Switzerland, I received my LLM in International Dispute Settlement from the Graduate Institute – University of Geneva, and started working for the United Nations. I served as a Legal Officer for the United Nations Office at Geneva (UNOG), acting as Counsel for the Respondent before the United Nations Dispute Tribunal. During my time at UNOG I also worked on investigations, alternative dispute resolution measures, and advised on policy matters. I also served as a Legal Officer at the World Intellectual Property Organization, a specialized agency of the United Nations, in the Office of the Legal Counsel. In 2017 I transitioned back to the private sector, and I am currently Legal Counsel for Philip Morris International (PMI) in Switzerland in the Regulatory Frameworks and Policy group. My work at PMI focuses on international affairs, illicit trade prevention, and advising on global regulatory matters. In 2018 I was privileged to be named in the Global Top 100 Most Influential People of African Descent under age 40, in honor of the United Nations Decade for People of African Descent (General Assembly Resolution 68/237) and in recognition of my contributions to the legal profession. One aspect of William & Mary that helped prepare me for law practice was the opportunity to participate in a study abroad program at the Instituto de Empresa in Madrid, Spain. Through this experience I was exposed to various aspects of the practice of international law, which helped guide my career path tremendously. This experience also gave me the opportunity to improve my Spanish, which was invaluable. Throughout my career I have found that language skills are essential in our diverse profession, especially when working in an international environment. The ability to work and converse in Spanish and French has allowed me to gain experiences in different contexts and countries. I am very grateful to have had the opportunity to further develop my language skills while in law school. I was also attracted to the citizen lawyer approach and the public interest focus at William & Mary and I have carried this philosophy with me throughout my career. W&M was the right fit for me for a variety of reasons. I was impressed with its approach to practical skill-building through clinics and the Legal Practice Program. It also has a strong reputation among a variety of employers from law firms to government to non-profit. But above all else, the community aspect of the campus and the student body was what drew me to William & Mary. For three years, I felt I had a good group of friends and professors who were looking out for me and making sure I had the best possible experience. Now I am a senior associate at Ropes & Gray, a large, international law firm based in Boston. I primarily focus on representing clients before the Department of Justice, the Federal Trade Commission, and international and state antitrust enforcement authorities in antitrust merger reviews and civil antitrust investigations. I also provide strategic counseling and compliance advice across a broad range of industries including health care, pharmaceuticals, and consumer goods. My relationships with my professors each semester is what I am most grateful for when I look back at my time at W&M. I had an opportunity to do an independent research and writing assignment with Professor Alces. He took a very hands-off approach and empowered me to think critically and write concisely. Ultimately, the article we wrote together won an award and was published. Those accolades aside, I learned a tremendous amount from one of the best writers in the faculty. Unlike so many other law schools where you are merely a section number, I felt my professors took the time to learn about me, my interests, and what I needed in order to be a successful student. The open doors at W&M were invaluable. The opportunity to attend a law school with such a stellar reputation within driving distance from D.C. as well as my hometown of Virginia Beach was extremely attractive. As a public institution, in-state tuition made the decision easy as William & Mary stood out as a relative bargain. I also had a chance to visit before making a decision, and meeting top notch faculty and hearing about the quality of life from students sealed the deal. Shortly after graduating from William & Mary I was hired by Facebook to focus on policy issues. My first role was to work with developers to help them come into compliance as they built video games and other apps on Facebook Platform. I then transitioned into a role handling intellectual property issues, building out operations for Facebook to respond to notice-and-takedown requests. I then spent several years as a Privacy Program Manager and reviewed all of Facebook's new products and features to make sure they respected privacy commitments made by the company. After 6 years at Facebook, I joined a technology startup in San Francisco called Slack where I work as Product Counsel. Part of my job is to help review new products and features to ensure they're legally compliant. Slack is one of the fastest growing enterprise apps in the world, and I'm excited to work with our product teams to create awesome team communication tools. When I came to William & Mary, I knew I wanted to focus on learning about technology issues. I had the opportunity to take classes on copyright litigation, European Internet law, privacy, and much more. My classroom experiences helped me land quality internships in the field. I'm thrilled that William & Mary gave me the opportunity to go from studying in Colonial Williamsburg to working in Silicon Valley. While at W&M I took full advantage of the student clubs and activities that the school offered. I had the chance to serve as President of the American Constitution Society and host a number of prominent speakers. I had a note published in the William & Mary Environmental Law & Policy Review. I hosted my very own radio show on the college's station (WCWM 90.9) to take a break from studying. Best of all, I first met my wife while she was signing up for a club at the law student activity fair! In addition to its terrific academic reputation, I chose William & Mary because of the incredibly personal approach the Admissions office took to get me interested. I could tell that W&M was a place where every student was valued. I am devoted to serving people who have encountered our criminal legal system. After law school, I spent 3 ½ years as a public defender in Newport News, Virginia, representing defendants in misdemeanors and felonies. In 2014, I became a legal fellow ACLU of Virginia in Richmond, working on policy, public education, and lobbying the General Assembly on criminal justice issues. In 2016, I returned home to Iowa, where I work as a staff attorney for Iowa Legal Aid in Des Moines. In addition to traditional legal aid work like defending low-income tenants in eviction cases and helping domestic abuse victims get civil protective orders, I also lead our Race Equity Project. This project focuses on removing barriers to employment and housing for folks who have encountered the criminal legal system, by helping them with expungement of records, court debt issues, and barriers to transportation such as driver’s license suspensions for nonpayment of fines and fees. After my first summer internship I knew that I wanted to focus on criminal law, so I took as many courses as I could in that area during my second and third years. I also tried to get as much practice experience as possible. W&M offers clinics and three-credit externships that allowed me to use my third-year practice certificate to get into the courtroom during my third year. I also took several courses with papers rather than final exams, which allowed me to get feedback from professors on my legal writing. After graduation, I began my career as a commercial litigation associate with Drinker, Biddle & Reath LLP in its primary office in Philadelphia. After three great years there, I accepted a position as an associate with a more specialized, mid-size environmental and energy law firm in the Philadelphia area, Manko, Gold, Katcher & Fox LLP. To this point, my practice at Manko has focused on environmental litigation. I like being in a position where I am charged with applying the changing aspects of business and industry to the law. Every new case brings a new set of complex underlying facts, often in a subject matter area that I never anticipated I would encounter. I consider myself very lucky to be in the midst of a career where I learn new things in new areas on a regular basis. I think the most effective legal learning experiences occur when more senior practitioners critique my written and oral presentations of legal arguments. W&M gave me a number of these opportunities, through academic competitions, seminars and clinics, and through guiding me toward valuable externships and summer employment. I began my career at a firm with a very generous and supportive pro bono policy, where approved pro bono hours were counted directly toward billable hours. In my first three years of practice there, I represented a number of interest groups and indigent clients in cases involving voting rights, civil rights, criminal law, property issues, and family law. While also rewarding to support people and causes that I believe in, working on these cases gave me great legal and personal experience by allowing me to establish a more direct client relationship than in many of my traditional cases. I hope to continue to strengthen my practice in this area and increase my community involvement in the coming years. Soccer, football, and softball intramural championships with great groups of classmates stand out in my mind. Joking aside, working a full year with the Puller Veterans Benefits Clinic and having the privilege to represent and get to know clients who truly deserved and needed the highest quality of legal representation was my most priority- and career-shaping experience at W&M. When I decided to return to school for law school, I could not have predicted what an impressive and pleasant group of classmates I would have. So many of them had diverse, interesting backgrounds and experiences, and everyone seemed to have their own admirable career goals. Working with and living within a five minute walk, drive, or bike ride of so many of these people made my three years in Williamsburg fly by. I would recommend W&M to prospective students for many reasons, including: professors who care about individual students and focus on the teaching aspect of their jobs; an advantageous geographical setting close enough to larger cities to offer opportunities in the field during the semester but also separated enough from those areas to allow students to focus on coursework and school-related endeavors; and a truly unique student body that is genuinely invested in the individual and mutual success of its members. Gabriel Walker '13Sr. Manager Employment Law Partner at Reynolds American, Inc.
Sr. Manager Employment Law Partner at Reynolds American, Inc. I came to William & Mary to get a quality education in an intellectually rich and stimulating environment. More important, I came to William & Mary because of the people. From my first visit to the law school as an admitted student through my current practice of law as an attorney, the faculty and staff have always made me feel like I’m at home at William & Mary. I am the Senior Manager Employment Law Partner at Reynolds American, Inc., where I help to oversee all labor and employment matters for the company, including: advising/counseling, investigating and handling claims of workplace discrimination and harassment, and policy drafting/revising. I am a former labor & employment attorney at LeClairRyan in Richmond, Virginia, where I practiced in both state and federal court. The best part about practicing law is that you are constantly learning. For those who like to challenge themselves mentally, the practice of law gives you the perfect opportunity to do so on a daily basis. Being a citizen lawyer, in my opinion, means being engaged with your community and striving to effect positive change where you can. I count myself as being fortunate to have studied law with other individuals who fit this description, and who have encouraged me to continue to be active and engaged in my community even while practicing law. I chose William and Mary for practical and emotional reasons. Practically, it was a far more affordable option than some of the other schools I had been accepted to. I was interested in pursuing a career in public interest and did not want to be burdened with an unmanageable amount of debt. Although I ended up going into private practice rather than public interest, I am still so glad I am not facing a mountain of debt. Emotionally, I chose William and Mary because it just felt like home when I visited. Everyone was so friendly and eager to be helpful. During my three years there I found those initial impressions to be very accurate. My classmates were always willing to help out and would do things like email notes to me if I missed class, before I even had to ask. The small town surrounding fosters a sense of community that brings William and Mary students together. I guess it is difficult to be too cutthroat when you are at the library studying with all the same people you hung out with at the bar the night before! I am a third-year associate at Venable LLP in the D.C. office. During my time as a summer associate here I tried lots of different types of law, but since starting full time I have been primarily focused on trusts and estates as part of the tax and wealth planning group. I spend most of my time drafting wills and trusts for high-net-worth clients and helping to administer clients’ estates after their deaths. After taking Professor Chason’s Trusts and Estates class 2L year I was pretty sure this was the area I wanted to focus on, and I am so glad it worked out!